I know what you're thinking: more toys? Yes, MORE TOYS. MegaHouse manufacturers are planning to release a series of irresistibly cute Rockman-themed figures later this year under their "Game Characters Collection Mini" line. A grand total of twelve 30mm figures are being produced including Rockman, Blues, Roll, a few Robot Masters, and color Rockman varients (UPDATE: all figures revealed). The twelfth figure, shrouded in mystery, looks to be a helmet-less version of Rockman or another character of similar proportions. The figures are expected to release in mid-June in Japan for 399 Yen ($4.82 USD) per figure. No word on an internationally release but, if I'm not mistaken, some of MegaHouse's products have been sold outside of Japan in recent years. Pre-order details should be surfacing soon. Stay tuned! Cute, but the figures kinda look like they're in poor quality. MUST BUY ALL OF THEM. That's all. I might be able to get provided they ship it to stores in Malaysia. Ooh, Snake Man! About time he got something. Rockman Rockman 3 and 4 confirmed! j/k j/k. 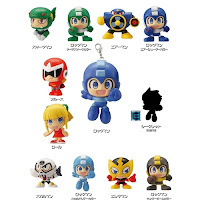 I want the Proto Man one. They said sheepman is the first animal character now I remember that snakeman is animal name/character right? Cute i want one I hope theres more like from megaman 9 & 10 splaswoman & nitroman so nitron can transform and splaswonman can be cute in those details. It is helmetless mega, I already saw the picture. Just open the image and change image nr in the adress bar to 12/13, not sure which one anymore. @Omar Wow, that is a little disturbing. They're just toys. That's because you're not a true Megaman fan like me.